There are miles and miles of mountain bike rides in the Big Bend. Below are details of some of the more popular rides. Check in at the State or National Park for information on road and route conditions as well as weather info. 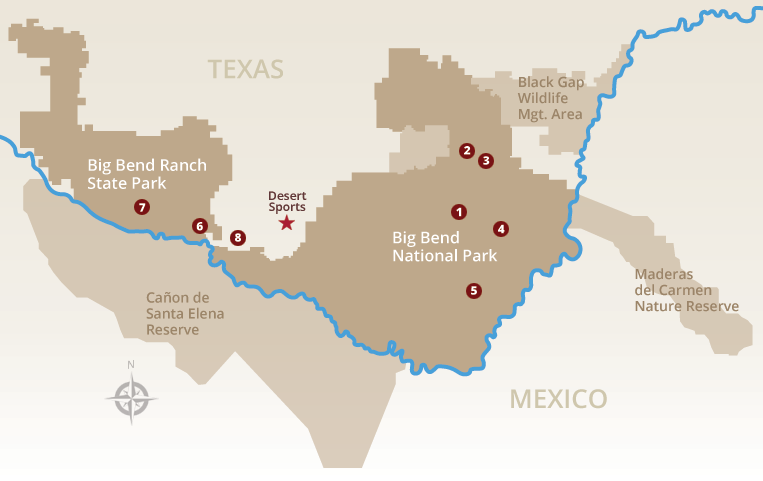 For more information on cycling in Big Bend, including road riding, be sure to stop in to see us at Desert Sports! IMPORTANT: This is a remote and unpopulated area. You need to be able to help yourself. Make sure you carry everything you need for your ride: water, spare tubes, tools, snacks, appropriate gear. Pay attention to the weather. Summer heat and other extreme weather conditions may significantly increase the difficulty factor of rides. Be aware of the possibility of flash floods, summer lightning storms and extreme temperature drops in the winter months.